Cyclone Gita hit Tonga on the night of 12-13 February, destroying homes and severely damaging infrastructure on the most populated island of Tongatapu. About 80 percent of the population was affected and over 4500 houses being damaged or destroyed. Government and NGOs have been quick to mount a coordinated response. 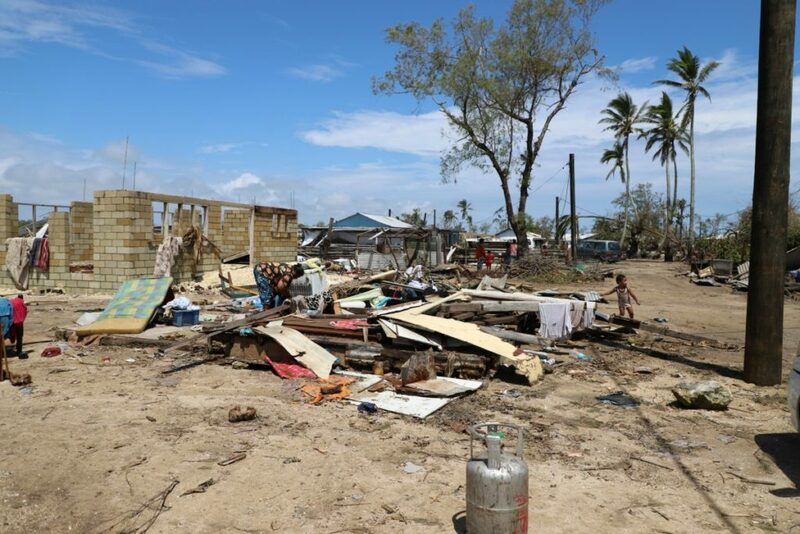 Caritas Tonga is moving from immediate relief distribution and social support to helping people rebuild homes and provide psychosocial support. Caritas Tonga staff and volunteers, working closely with the Tongan National Youth Council, distributed tarpaulins, water, hygiene and kitchen sets, in the days immediately following the cyclone. The response reflects years of training and disaster preparedness across Caritas Oceania agencies, in cooperation with other humanitarian organisations, and with funding support for pre-prepositioned supplies by the New Zealand government. Amelia Ma’afu, Acting Director of Caritas Tonga, is convinced that the prepositioned supplies kept by Caritas and other organisations ensured a quick response. One of those that received a Caritas tarpaulin was Palasa and Vaea Lolesio and their family of six. Their house, in Fo’ui village, was almost completely raised to the ground by the storm. Only the kitchen and a small bedroom on the side of the house still has walls standing. Vaea, who works as an occasional building labourer, was able to rescue some of the roofing iron from the where the wind had blown it, and straighten it out to use over the area they now sleep in. In spite of his efforts though, the roof still leaks through old nail holes and splits in the iron. The tarpaulin he received from Caritas helps to ensure that rain doesn’t get in while they sleep although it’s a small space for a family to live in. Even so, Anna, 13, and the older children seem remarkably resilient and stoic in the face of the destruction they see around. They have been able to return to school and are doing what they can to help out around the house. Vaea, with the help of his brother, is committed to rebuilding the house but can’t afford the materials that are required. He says he has the skills necessary and will start the rebuild as soon as he can. In partnership with Caritas Aotearoa New Zealand and Habitat for Humanity, and with support from the Tongan government, Caritas Tonga will implement their early recovery activity. This is a Support to Self-Recovery Programme to provide timber, tools, equipment and training so people can restore their own houses with “Build Back Safer” principles an essential component of the repair work. Ma’afu says “We are developing a programme that promotes ‘building back safer’. It encourages the use of cyclone strapping and bracing and introduces techniques that will increase the resilience of the home to future storms and earthquakes. “The homeowner will then be able to use these skills as they rebuild their homes, although we will continue to supervise and support during the repair process”. 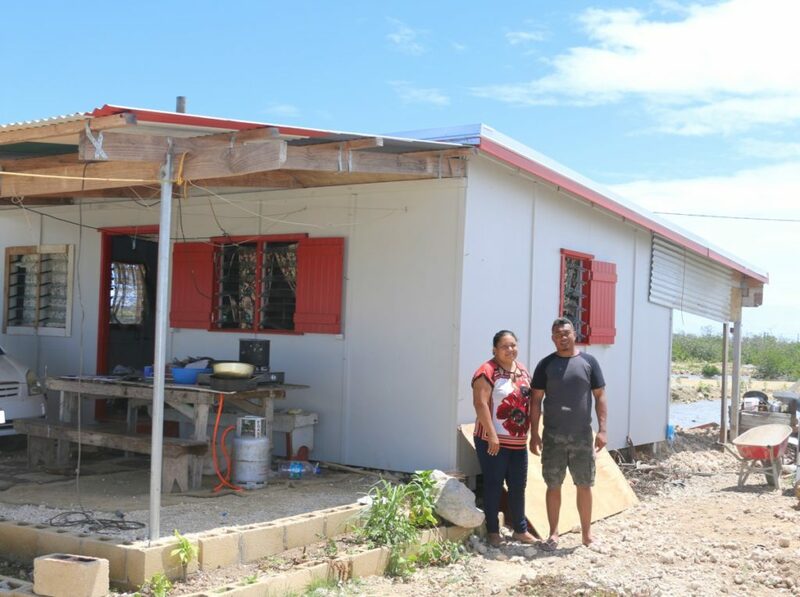 Cyclone resistant family houses built in 2016-2017 through a Caritas Tonga/Habitat for Humanity housing programme came through Cyclone Gita with hardly any damage. Viliami and ‘Ilaise Moala with their two children were among eight households who had benefited from a ‘pilot build’ programme run. Viliami and ‘Ilaise heard about the programme through a Caritas member and asked to be involved, for land they owned at Popua township on the edge of Tonga’s capital of Nuku’alofa. Viliami does fruit-picking in Australia May-December every year, and runs a taxi service when he’s home in Tonga. ‘Ilaise weaves fine mats and sells them to relatives in the United States. Through these income sources, they’ve almost managed to pay back the TOP20,000+ loan they took out to pay for their share of the house. The house was built in three weeks time from materials shipped in by Habitat for Humanity. Construction was by the family along with build volunteers comprised of Habitat and Caritas staff, including its Acting Director Amelia Ma’afu. The house also sits about a foot higher than most other houses in lowlying Popua which is prone to flooding during king (super-high) tides or heavy rain. Each of the pilot build houses is built as a single large room, but Viliami and ‘Ilaise have modified that further by internally subdividing it into two bedrooms and a living room. They have also extended the living space with verandah rooves front and back. “We have lots more plans for the house,” they say, planning to extend it further at the back and enclose the outdoor kitchen to make it more secure. When Gita hit, the Moala’s took refuge in the hall next door just to be sure, along with eleven other families. However, their house remained secure, apart from water coming through ventilation gaps between the walls and roof. Caritas Tonga’s Amelia Ma’afu says it has been a challenging Lent, but sees the response to Cyclone Gita as an opportunity for a new resurrection. “A new resurrection for development in the home, community and in the national context as well,” she says.